Home › Uncategorized › Become a Certified Vision Board Coach in 4 Weeks! 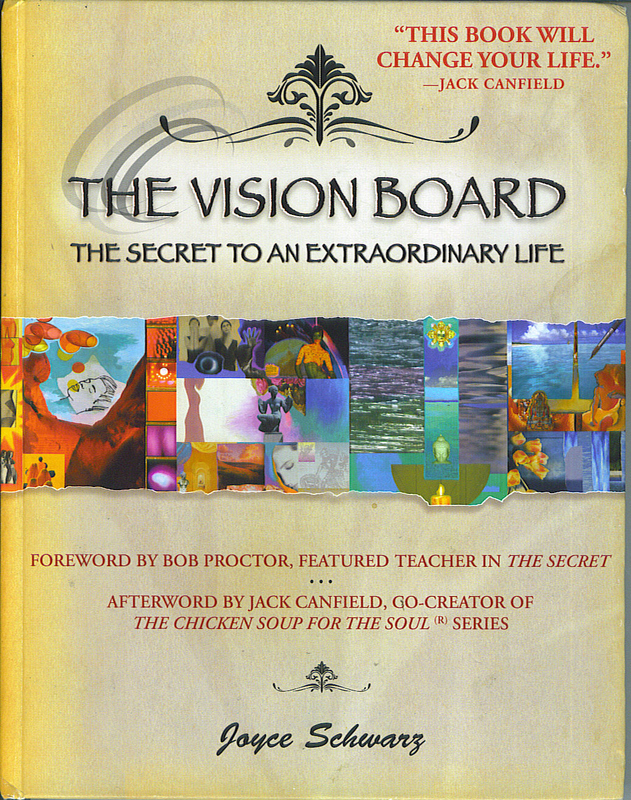 Become a Certified Vision Board Coach! If you are tired of fulfilling somebody else’s dream and ready to live an Inspiring life by becoming a Certified Vision Board Coach in as little as four weeks, Click Here—-> Vision Board Coach Training! Become a Certified Vision Board Coach in 4 weeks via LIVE 90 minute teleworkshops with best-selling author Joyce Schwarz via phone. No computer is necessary you can call in to a teleconference number (you get the number after you sign up) and then listen and participate in the call LIVE. If you miss the four 90 minute calls they are all recorded and you get them to download and keep forever. There is also a way to listen to the calls after via phone and I’ll explain how you access the playback via phone after you sign up. The Certified Vision Board Coach class has been featured on national and international media including FOX NEWS, PBS, TV GUIDE and more. Joyce Schwarz and THE VISION BOARD INSTITUTE, http://www.visionboardinstitute.com are the only people/group accredited to offer the CERTIFICATION OF CVBC (Certified Vision Board Coach). The four week course covers the following topics. Classes are kept small 4 -6 people max so you get lots of individual attention during the class. And Joyce remains open for quick phone calls from you in-between and for emails from you too. Visioning is a self-exploration process that can be done with individuals or in groups. You can do it for yourself and your business and life or practice these principles with your clients as a coach/student or in your workplace. Discover how VISTA, WORLDBANK and the United Nations use visioning to set goals, realize dreams and to help people embrace hope again after tragedy, job-loss or even death in the family. VIsioning is also used on a daily basis to create the best possible lives daily, weekly, monthly and beyond. d) How to do the PICK THREE EXERCISE that lets you vision anywhere without any magazines, or any computer or any glue! BONUS AUDIO — Lynn Andrews — you will be sent a bonus audio from the famous Medicine Woman Lynn Andrews after your first class so that you get even more info on how to use visioning beyond what was discussed and the steps that Joyce Schwarz reveals in the WEEK #1 class LIVE via phone. WEEK #2 WHY A VISION STATEMENT IS CRUCIAL for life , work and family. You’ve all heard about mission statements (which some from the top down in corporations or in other institutions) but we go beyond the old fashioned top down Mission statement to explore and tap into the power of a VISION STATEMENT. What can you vision for your future and how to create the vision path to that vision! a) How to begin to live your VISION TODAY — yes, even before you do a complete vision board. c) How to find DEFINING IMAGES anywhere and everywhere and tap into those that are RIGHT for you! Bonus audio is from Jim Stovall blind author who talks about seeing versus looking. He is the author of the best-selling book THE ULTIMATE GIFT. In this week you’ll discover how to create a vision board using our specific CVBC methods. c) HOW TO USE THE GRABS formula that is the 5 step secret formula that Joyce shares in her book and with her CVBCs to make sure that the vision board is as powerful as it can be! d) How to move away from magical thinking — and magic wands into using both your left (analytical) and right (intuitive) brain power for your and your clients/students etc. f) How to activate your vision board and how to help people who come to you when their VISION BOARD IS NOT working — how to do a vision board analysis. e) How to use your vision board skills to help raise funds for your local church, charity or nonprofit. f) How to employ the vision board creation techniques and life and work visioning into your coaching practice if you are a coach or into your own life. 2) Fill out a simple FINAL FORM graduation form with 8 questions including questions about what you learned and how it changed your life! Ready? Begin your training now…Click Here!